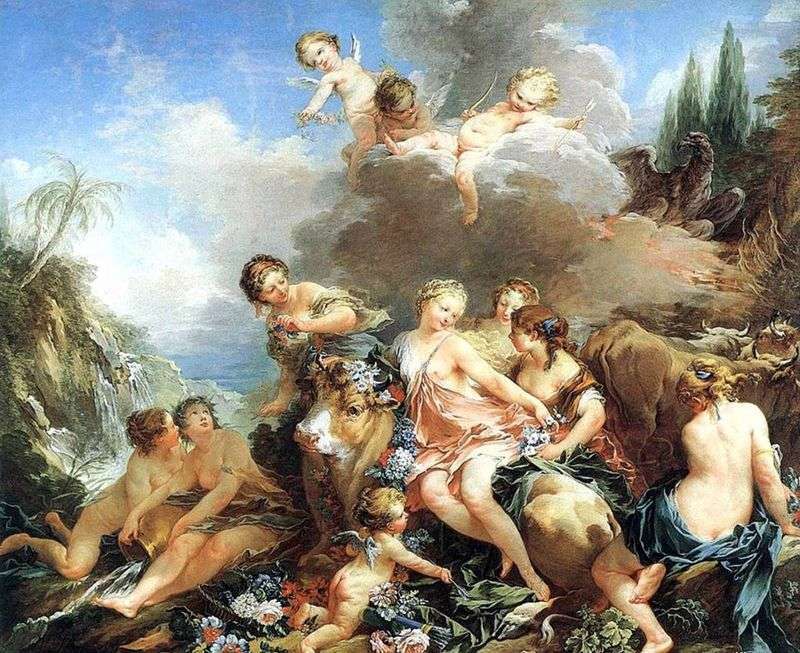 A painting of the mythological themes of the French artist Francois Boucher “The Abduction of Europe”. The size of the picture is 231 x 274 cm, canvas, oil. Painter Boucher repeatedly turned to this mythological story, also known for his painting “The Abduction of Europe,” written in 1747, and now stored in the Louvre. Europe, in Greek mythology, the daughter of Phoenician King Agenor, kidnapped by Zeus, converted into a bull. On the back of this bull, Europe swam across the sea and got to Crete, where she gave birth to Zeus Minos. The decorator’s talent and the fantasy of the artist François Boucher have appeared in his many mythological scenes. Ancient Greek and Roman gods, goddesses and other mythological characters were depicted against the background of imaginary ancient buildings. These scenes are spectacular in composition, filled with a dynamic brushstroke, written in a free, picturesque manner and with a bright silver color scale, which indicates the artist’s passion for the painting style of Giovanni Battista Tiepolo. Boucher loved not only the use of certain several colors, but also catchy tricks. The artist then resorted to abundant glazes, giving the appearance of a miniature or porcelain surface, then wrote free liquid strokes, imitating the manner of Tiepolo, and in the palette – the color of the Venetian masters. Francois Boucher was the interpreter of many artistic manners, feeling creative freedom as a true virtuoso of painting of the beginning and the middle of the XVIII century. Description and meaning of the painting Abduction of Europe by Francois Boucher.